I have mentioned that I thought that this cookbook would be easy to do since it is a matter of going from print to screen. The fact is I had to rewrite most - if not all - of the recipes. There will be good number that is not on the blog or at least not yet. It has taken a lot longer than I had earlier envisaged. One reason why I had to do some rewriting is because of some difference in expectations when it comes to print and screen. For one, my blog started out on a very casual and sometimes silly tone. Some of you who visit the blog to be entertained and not just get recipes will be amused by some of these posts, largely satirical, which I categorised under "just-for-smiles." Even some recipes here are long because they tell stories. Your pork is already in the pot and cooking. And you panicked because you had a feeling that you had missed out something and your intended Tau Yew Bak may turn out into something else. If you rush to my blog, you could end up frustrated because you have to scroll down your iPad a few times before you get to the recipe list. One advantage which the blog has is the luxury of space. It costs almost nothing to add one more screen space, except for the time of the writer. A cooking blog can afford to meander and make some silly detours. And I think that is the whole point of coming up with a cooking blog. Food and cooking should be fun and reflect on life, family and culture. And each post should reflect on the mood of the writer then. A cookbook generally does not function in the same way. You pick up a cookbook - at least most of the time - when you are rolling up your sleeves for some serious cooking. Or maybe you are planning the menu for your next guests' invite. Silly remarks are acceptable and maybe even expected given the informal nature of a blog. But to encounter that in a cookbook is something else altogether, unless there is ample space in that book to consistently carry the same informal tone. This is why I had to do a lot of rewriting. There is greater focus on techniques and recipes in the book. The recipes are generally tighter as final means, well, final. A book also has a shape which a blog does not have. A blog is never finished. It may have a beginning and then it rolls on endlessly. There is no mid-point or end. No chapters. Categories and dates give it some shape. But that's about all. A book has a beginning and an end. The way the recipes, essays (and yes, lots of them) and photos (lots of them too!) are laid out is important. Where they are in the book communicates something, adding to the direction you want your readers to go, the overall picture you want them to get. As you can't google search book contents, the shape of the book also enables easier searching. A recipe is never "perfect" and evolves as ingredients, expectations and taste buds change with time. Here is why I find the blog invaluable as indeed, there are so many ways to cook Nasi Lemak and Nasi Lemak itself, is not a fix list of ingredients and dishes. Likewise, life and faith is not static and I cherish the blog for the way it reflects on the life experiences and growth of the author as a cook and person. Interesting. Different. Complementary. Blog or book, they each have their place. If you do lay hold of my book, I hope you will continue to keep an eye on the blog. 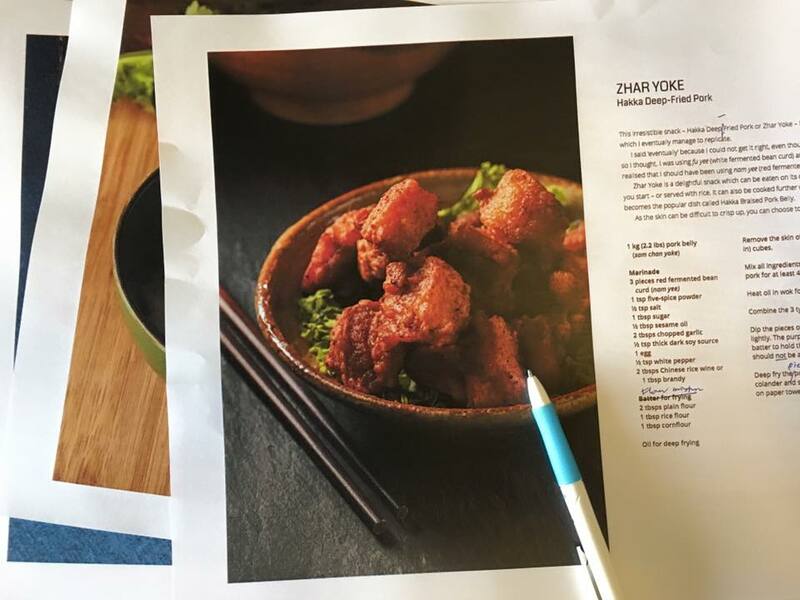 Even photos are used differently in a cookbook. That will be the subject of this diary for the next post. I pre-ordered your book, which will be a favored item, based on the peek at your proof pages. I will certainly continue to visit your blog, since it is often full of surprises, both humorous and culinary. Best wishes!